is it possible to fit a hand strap to the K-70? what do you set your programable buttons for? Abstract Hair thin DOF 105% Crop. Tiny piece of fuzzy debris caught by a spider web. Because it is a mirrorless camera, the Pentax K-01 uses a contrast-detect autofocus (CDAF) system rather than the traditional phase-detect (PDAF) system found in DSLRs. While CDAF is generally slower and less accurate than PDAF, the K-01 performs quite well overall and its CDAF system has been significantly improved over that found in Pentax DSLR Live View modes. The K-01 also has some new features to make focusing easier, such as auto-zooming and focus peaking. Before we go on, we would like to state that we believe that the K-01's AF system, just like that of the Q, is more than adequate for the camera's target audience. Only advanced users will be able to notice its few true shortcomings. The K-01 has 4 AF modes: spot, select, face detect, and tracking. You can select the AF mode via the first tab in the record menu, or via the info screen. Each mode makes use of one or more of the K-01's 81 AF points, which span all but the edges of the frame. It should be noted that these "points" aren't physical- they merely represent a partitioning of the frame as performed by the AF algorithm. Spot mode: only the four central focus points are used by the camera. The camera focuses on what's in the middle of the frame. If you want to get the best performance out of your camera, avoid this mode and use select mode with 25 points instead. Scroll down to our AF accuracy tests for more details. Select mode: you choose any cluster of either 4, 16, or 25 of the 81 AF points on the screen. This is done by pressing the "OK" button while in live view. Select mode is great for advanced users. 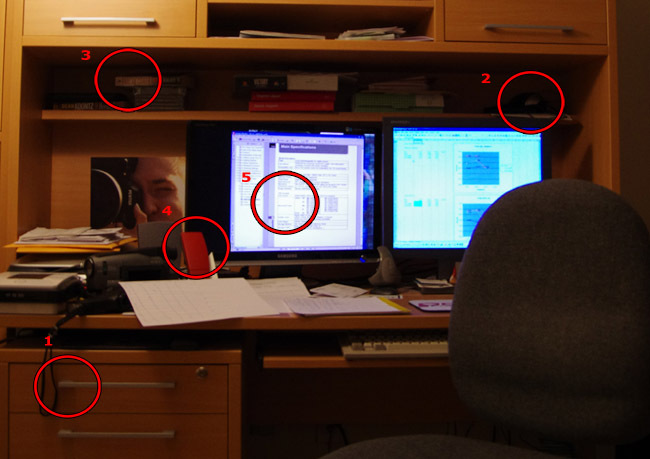 Face detect mode: the camera uses the central 25 AF points to focus and tries to detect the presence of a face in this area. If it locks on to a face, it will use all 81 points to track it. This is the default mode and we believe that most users will stick to using only it. Tracking mode: you focus on an object and the camera attempts to keep it sharp at all times. In this mode we see the downfall of CDAF, for as soon as your target goes out of focus, the camera needs to re-adjust the focus by guessing rather than calculating as PDAF would do. This leads to slower, less accurate, and more noisy focusing than a DSLR's continuous AF mode would deliver. The camera's reaction time is also quite slow. Note that tracking mode keeps a single absolute point sharp, so it won't "lock on" to a moving object and keep it in focus. Rather, it simply tries to keep the same spot on the screen in focus. Generally, the K-01 generates more screwdrive noise than a DSLR while focusing as its algorithm first needs to move the focus back, then forward, and then finds an equilibrium. If a lens has long throw, you will also notice that the AF motor doesn't operate at full power at all times, likely in order to allow for the camera to make the necessary calculations. SDM/DC lenses are still quiet as always, but you will find that the K-01 moves them around more (and more slowly) than a DSLR would. Below we compare the AF noise of the DA 18-135mm lens vs. the 40mm XS kit lens, and show now much more slowly the camera adjusts the focus at longer focal lengths and throws. As we've already mentioned, the AF speed of the K-01 is quite good and under normal shooting conditions (i.e. outdoors during the day, or indoors with plenty of light). It consistently outperformed the K-5's Live View CDAF in our tests, and it in fact locked focus faster just as quickly as the K-5 PDAF quite often in relatively low light. Its performance was best when using lenses with short throw, such as the 40mm kit lens or the lenses mentioned in our K-01 lens guide. However, because of the way the K-01's focusing algorithm works, AF speed deteriorates faster than it would on a DSLR as you use lenses with longer throw, such as long zooms, macros, or telephotos. For example, a 100mm D FA macro lens focuses much, much slower on the K-01 than it does on the K-5, as the K-01 operates the motor more slowly and doesn't usually know which way to rotate it up-front. It also takes the K-01 longer to lock focus when the image is already focused or close to being in focus. We performed two AF speed tests to compare the K-01's AF speed to that of the K-5: one test with a target 5 feet away at 4 different EV's, and a test with a target 15 feet away in bright daylight. All times were measured 5 times and then averaged. Both cameras used the SMC Pentax-DA 40mm F2.8 limited lens. All measurements are in seconds. * denotes that the AF assist light fired. Green = best time of the series, White = second place, Red = last place. One observation we made was that the K-01 use its AF assist light much more frequently than that K-5, which seems like a software optimization of the AF system. This test also clearly shows that the K-01's CDAF has been much improved over that of the K-5, but that the K-5's PDAF is still superior, especially when there is more ambient light. For this test, we pointed the camera at a contrasty bush approximately 15 feet away. As before, a tripod was used. We measured an EV value of 15 using the Pentax digital spotmeter. All measurements are in seconds. Green = best time of the series, White = second place, Red = last place. This test again shows that the K-01's CDAF system has been much improved over that of the K-5, but that PDAF still greatly outperforms CDAF outdoors. While it seems that Pentax has made many improvements to the K-01's CDAF compared to that of DSLRs (such as making use of the AF assist lamp earlier), it is still nowhere near as accurate as PDAF in tough shooting conditions. This becomes painfully apparent in low light (7EV or less), where the K-01 simply can't lock on targets with which the K-5 and K-r has absolutely no trouble. The K-01 also has trouble locking focus on targets which are outside the range of its AF assist light, even in conditions in which a PDAF camera would not need to make use of its assist light. We were able to consistently reproduce this behavior in 3/4 EV of ambient light and targets at ranges of 15 feet or more. We performed an somewhat arbitrary yet realistic close-range indoor low-light test of the K-01 and compared its performance to that of the K-5's PDAF system in ambient lighting of 1 through 8 EVs. For each spot at each EV, we took the best of 3 attempts and started at infinite focus with the DA 40mm limited. We chose this lens because it is relatively fast and has quick shift, unlike the XS version, and because we had two copies readily available. The distance from the camera to each test point was approximately 8 feet. Thus, you can see that while the K-01's AF seemed faster in low light, it isn't as accurate. Sometimes it can't seem to lock focus even when one would think that there is more than enough contrast in the subject, i.e. at Site 1. We can therefore see that the subject's texture plays a much bigger role for the K-01's AF system than it does for the K-5. Another interesting observation about the K-5's PDAF system is that it seems more accurate at 1EV than at 2/3 EV, i.e. when the assist light is all that it has to work with. In order to make manual focusing easier, the K-01 incorporates focus peaking, a feature new to Pentax cameras. Focus peaking highlights/outlines parts of the frame that are in focus so that you can more clearly see whether or not you've focused correctly. Focus zooming (autozoom) is only available in AF mode, and enlarges the image after the camera has locked focus so that you can verify that the image is properly focused. When enabled via the first tab of the record menu, autozoom engages about one second after focus is achieved, giving you the option of either shooting or recomposing prior to losing sight of half (or more) of the frame. The lack of a delay and the inability to disable AF autozoom was a major shortcoming of the K-5's live view mode, so we're happy to see the added flexibility in the K-01. 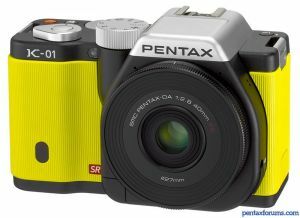 We are unable to compare the K-01's focus peaking feature to that of other manufacturers, though we have received user-submitted reports than the Pentax system is somewhat inferior to that of Sony. The K-01 isn't meant for shooting sports or things that move quickly. Using a 100mm lens, we tried shooting butterflies in release priority mode as well as using focus tracking to keep things sharp, but it was still very difficult to get a sharp shot. In sport or select mode the camera is able to lock on to moving targets quite accurately, but don't expect it to be able to re-adjust the focus in a timely manner should changes become necessary. It should also be noted that while the release priority custom function does allow you to fire the shutter when focus hasn't yet been achieved, the K-01 doesn't have an actual continuous autofocus mode (only the tracking option). The K-01 has a good AF system which does it job well, and it has a very generous feature set for its class. The AF is not perfect, but it's by far the best contrast-detect AF system we've seen from Pentax to date. Considering that mirrorless interchangeable lens cameras have only been around for about 3 years, it's no surprise that their AF systems are still inferior to those of DSLRs, but also inevitable that these systems will see improvement and innovation in the years to come. When compared to Pentax's DSLR phase detect AF system, the K-01's CDAF is slower in bright daylight and when the lens has long throw, but it hunts much less than we had originally expected, and it is certainly quite usable in practice. Our main complaint about the K-01's AF is that it has trouble locking focus in low light, and that there is no "auto" AF mode which can make use of all the AF points without tracking faces. It's also a shame to see that the AF motor usually doesn't operate at full power; Pentax should further improve the AF processing speed and improve on this in future models. Ready to get your Pentax K-01? Click below to place an order or check current pricing.